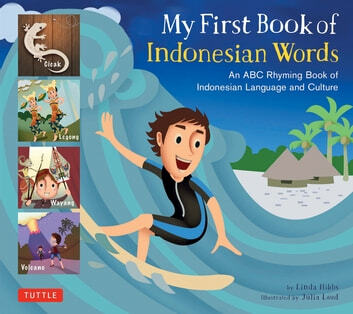 My First Book of Indonesian Words introduces Indonesian language and culture to young children in a fun, playful way. The familiar ABC rhyming structure combines with sparkling illustrations to encourage the natural ability of children to pick up new languages and vocabulary quickly. Words for things kids already know in English are joined by words specific to Indonesia, giving kids a glimpse into Indonesian life and culture. Everyday expressions—like "Apa kabar?" which means "How are you? "—give kids a chance to communicate in a meaningful way and show them that when it comes to courtesy and friendliness, other cultures have a lot in common with their own. Cultural and linguistic notes are added for the parents to enhance the Indonesian learning experience. The cheerful illustrations depict a friendly and culturally rich nation, where the people are happy to know you and to share a bit of who they are and how they live.